Links to a world of information. Bovine Petroglyphs at Jabel Maqla. Rock of Horeb: The Split Rock Discovered. 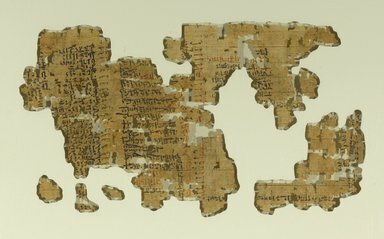 Hieratic Papyrus Dates: ca. 1809-1743 B.C.E. EKS Publishing Co. Hebrew for Everyone. We make data work for you! Inventory of all the Dead Sea Scroll Manuscripts compiled by Mitchell A. Hoselton. Maintains one of the finest collections of Egyptian art in the world, as well as collections of classical and middle eastern art, art of Africa, the Americas and the Pacific, decorative arts and textiles. Ranked among the world's leading art and archaeology museums, the Museum has 24 departments and houses encyclopedic collections, dating from prehistory to the present day. The museum features the most extensive holdings of biblical and Holy Land archaeology in the world. The Jewish Museum's permanent collection chronicles 4,000 years of Jewish culture through nearly 30,000 objects from around the world. The Museum actively acquires art, Judaica, and broadcast media that are both specifically and implicitly related to Jewish experiences, whether by virtue of the subject depicted, because of the implied intent of the artist, or because a work by a Jewish artist represents a significant contribution to art and cultural history. The Shrine of the Book is the home of several exceptional archaeological finds: the Dead Sea Scrolls and other rare ancient manuscripts. Mission of the Center for Security Policy: To identify challenges and opportunities likely to affect American security, broadly defined, and to act promptly and creatively to ensure that they are the subject of focused national examination and effective action. The Jerusalem Center for Public Affairs is a leading independent research institute specializing in public diplomacy and foreign policy. Founded in 1976, the Center has produced hundreds of studies and initiatives by leading experts on a wide range of strategic topics. Dr. Dore Gold, Israel�s former ambassador to the UN, has headed the Jerusalem Center since 2000. Founded by the Jerusalem Center for Public Affairs jointly with the Wechsler Family Foundation in 2001. The Institute provides a forum for discussion of Israel's strategic, diplomatic, legal and national security challenges. The Director of ICA is Ambassador Alan Baker, Adv., former Ambassador to Canada and former Legal Adviser to the Israeli Foreign Ministry. The Institute provides briefings, publications and up-to-date analyses and information for the foreign diplomatic corps and media representatives based in Israel as well as policy makers and public opinion shapers worldwide. Iranium The Movie; View Now. Aleppo Codex - Examine one of the oldest Hebrew Bibles. To Return to Previous Page Use Back Arrow on Browser.